What is Risk? Why is owning a home riskier than renting? One of Webster’s definitions for risk is listed as the “possibility of loss or injury.” Another definition states that risk is “the chance that an investment may lose value.” From a financial standpoint, we often think of “risk” as involving (i) uncertainty and (ii) potential loss. What’s not often said is that “risk” also involves potential unexpected gain. In fact, the heart of modern financial theory binds the concepts of risk and return into one model. Risk, more accurately stated, is not the chance of a loss – but rather the uncertainty associated with future events. In financial terms, a risky investment is one where the future set of cash flows from that investment (including from the sale of that investment) can vary considerably. Such respondents are wrong on two counts. First, recall that risk is a concept representing variation in cash flow. The $2,400 rent, while higher, is 100% certain. Renting is risk free: the tenant has a fixed $2,400 occupancy cost and is not responsible for any unexpected maintenance or other costs. The owner-occupant, by contrast, has a fixed mortgage but is responsible for repair and maintenance – which are hard to predict on a month-to-month basis. While repair and maintenance can be considerable, the real “risk” from owner-occupancy is that the owner-occupant also has the risk associated with the value of the underlying asset. As the timeframe from 2000-2011 has shown, home values are very volatile. They can rise and fall by 10% in a 12-month span. And when a 10% change in a home value is coupled with a 5:1 leverage (using a 20% down payment), that becomes a 50% change in owner’s equity. Thus, the owner-occupant is (perhaps unwittingly) investing in an asset that can have gyrations in equity that far exceed the average swings of the stock market. What about long-term risks of renting? The “risk” from renting comes at the time of lease renewal. At the end of the lease term, in most of America, the landlord has the right to request whatever rent he deems reasonable. Tenant is not obligated to accept such rent and may negotiate a lower rent or vacate the rental unit. Thus, the first uncertainty in the tenant’s cash flows (costs) comes in month 13, after the new rent is in force. And while the rental increase is uncertain, most landlords will offer a rent increase between 0 and 6% — meaning that the uncertainty is low. Over the long-term, the difference between a 0% increase and 4% increase can be significant, so the “risk” from renting occurs when renting is used on a very long-term basis. Owning also has long-term risks, but they result primarily from repair & maintenance and the change in the value of the underlying home. Can you give a mathematical example of renting risk vs. homeowner risk? •	Renter: annual rent increases range from 0% to 6%; assume a uniform distribution. •	Owner: annual repair and maintenance costs range from $0 to $3,000. Assume 0% occurs 40% of the time and 60% of the time R&M costs are uniformly distributed between $500 and $3,000. •	Owner: assume the underlying home value varies between -6% and +6% each year. Assume a uniform distribution. •	Owner: assume a 6% transaction cost to sell the home. 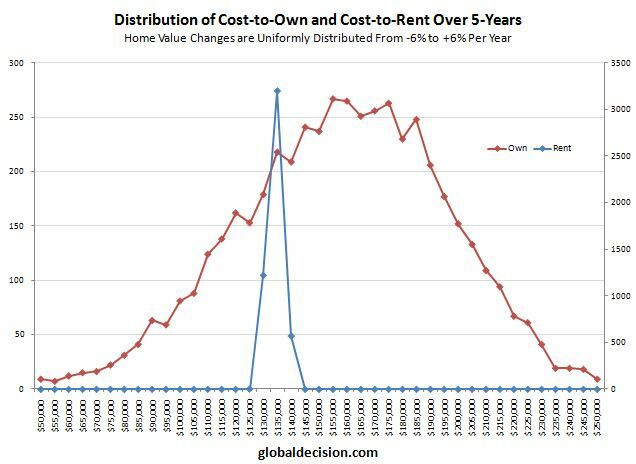 The red line (distribution of the cost-to-own) shows the clear risk associated with homeownership. While the renter has some uncertainty in her 5-year total cost of occupancy due to unknown lease price increases in years 2 through 5, the owner has many times more variability in her total cost-of-ownership. Because we model the housing market as being able to either rise OR fall in value, the owner’s total cost-of-ownership could be reduced or increased – based on the unknown: the performance of home values as an asset class. Owning a home in times of rising home values can be a strong financial gain. However, such potential upside comes with an equally large downside, where an entire down-payment can be lost in a falling market. Homeownership should thus be viewed as a financially risky activity, much as one would treat an investment in equities and other assets where past returns do not predict future performance. This entry was posted in own versus rent, real estate analytics, risk analysis and tagged home values, own versus rent, risk, simulation. Bookmark the permalink. One Response to Is owning a home riskier than renting?